How are you planning to market your products and services? That's probably the most relevant question for any business owner. And the answer isn't an easy one. Not because you don't have any marketing procedure to embrace, but because you're spoilt for choice these days. But have you ever given a thought about embracing drip marketing for your business? They are in-vogue these days. Because email drip marketing increases the open rate of emails significantly. Average single open rate of drip campaigns is 32.85%. In fact, drip open rates are about 3 times higher than the click through rates of emails sent individually. So, there’s no reason why you shouldn’t start a drip campaign to increase the return on investment for your business. So, what's the best way to do that? In this post, I’ll discuss how powerful drip campaigns are and will share actionable tips to build a killer email campaign that’ll increase sales and enhance customer retention. Email is an extremely effective marketing tool for businesses, both established and start-ups. And that's not without any reason. • 82% of B2B and B2C companies use email marketing to reach out to their customers. • Automated email messages experience 70.5% more open rates and 152% greater click-through rates than any business email. • With email marketing, you are 40 times more likely than Twitter or Facebook to get new customers for your business. Besides, here are a few benefits of email marketing, which can come in really handy at times. • It reduces your marketing costs by helping you go digital. • You can easily connect with your target audience. • It helps to spread the word about your business. • Ensures that you can connect with existing customer and attract potential ones. In short, email marketing can help you reach out to a wider audience within a short time. 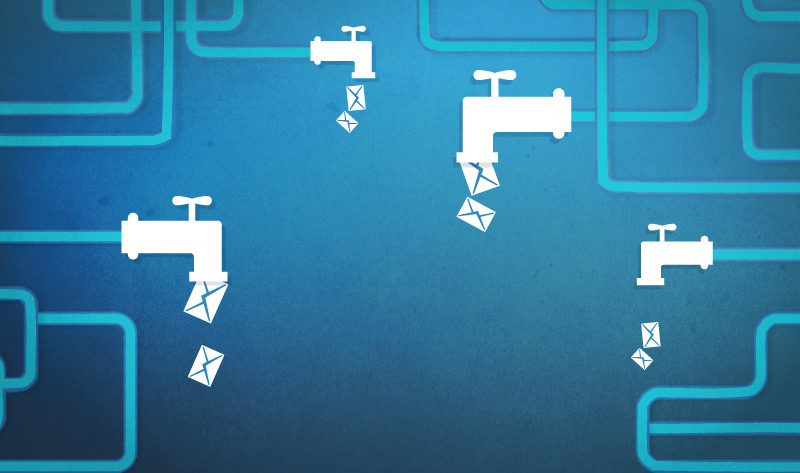 So, what is an email drip campaign? An email drip campaign refers to sets of automated emails, which are sent out based on various aspects, such as user actions, specific timelines, and so on. For example, when a user registers for an account or performs an action on a site, an email is sent out to him. So, the emails sent out for drip campaigns are not required to be written manually every time. They are chosen from a set of already written emails, which are sent out to share the necessary information with the audience at the right time. Is the email drip campaign really useful? How do they work? Let’s have a quick look at a couple of case studies about the use of the email drip campaign. Case study 1: A visitor registers on your website. An automated email is sent to the user to welcome him. Case study 2: A document detailing your business is sent to a user. If he opens it, he is given one option. If he doesn't open it, another method is tried until the end of the drip. This flowchart from the infographic on the website of Pardot, the marketing automation company, is a perfect graphical representation of the details of the drip campaign. So, the email drip campaign can come in extremely handy to establish a brand name for your business. But that’s not an easy task. You’ll have to ensure that the right steps are undertaken to give an edge to the email drip campaign’s efforts. So, how can you make your email drip campaign effective? Here are a few tips that can come in quite handy for the purpose. Why are you planning to begin an email drip campaign? The objectives are usually quite simple: it's either to boost the sales and get new customers, to increase brand awareness, or to retain the existing customers. But when you are starting the campaign, you should have a clear idea, which of these things you want. How will having a clear goal help? You can plan your steps of the email campaign in such a manner that they are meant to achieve the target you've already set for yourself. You have planned your email drip campaign. You have a proper goal in mind and you have also decided about the frequency of sending out the emails. Yet, you are not achieving the desired results. There can be several reasons behind this. The most common, in fact, is that the quality of the content shared on the emails is not quite as good as your target audience would like them to be. Remember, when you are sending out emails for marketing and for generating leads, you can't send out any write-up. So, you must create excellent email content before sending them out. Ensure that the content is engaging. You can shift from sharing simple text-based content and include various other media, such as images, videos, and so on. When you are engaging in a marketing campaign involving emails, you need to focus on one thing properly. That's the frequency of sending out the emails. You must have a clear idea about how frequently you should mail your current and prospective clients. • 42% people think you should email your customers 2-3 times a week. • 17% thinks you should mail 4-6 times. • Only a few people (4%) think sending mails more than six times a week actually helps. The frequency of sending out the emails will depend on the objective of your campaign. For what are you sending the emails? This will define whether the emails should be sent on a daily, weekly, fortnightly, or monthly basis. Remember, one of the most important reasons for sending the emails through drip campaigns is to ensure that your brand remains in the mind of the current and prospective customers. It will also drive them to subscribe for your products and services. The whitepapers or other documents can also be sent through drip campaigns. And these are mostly sent out on a fortnightly or monthly basis. You can also set the time of sending out the emails. They should be planned in such a way that the target audience gets it during such a time of the day when he is most likely to open and go through it. Even when you are sending the emails following the right frequency, you might get it wrong somewhere else. For example, you might send the emails on a wrong sequence. And that can be as bad as it can get! In fact, an error like this can impact your brand name. Besides, your target audience might feel that you are spamming them. When a person registers on your website, you are supposed to send a welcome email. You have set it to send out on day one. The next day, you are supposed to send out an email, which will ask the user how his experience of using your website has been. Imagine a situation where the second email is sent out first and then, the user receives the first email the next day. This surely is going to be a debacle. So, it is essential that you keep an eye on the sequence at which the emails are being sent out. This will help you perform the email drip campaign in a proper way. There are quite a few things that you need to manage while creating an email drip campaign. But it’s really not an easy task. And with so many things to do, you might miss out on one or two. Well, that’s really going to be the worst thing possible. Missing even a single of those emails or sending them on a date, which isn’t scheduled can have an extremely negative impact on the email drip campaign. So, is there a way to solve this problem? You can create a checklist, which will help you keep a track of all the steps of the campaign. It will also come in handy to have an idea of the emails, which are going to be sent to the potential as well as existing customers through the campaign. When you are sending the emails to the current and potential customers, ask yourself a few questions: why should the recipients be viewing your email and not consider it as another spam? Is there anything new they are likely to get from the emails? The emails should contain something of value for the recipients. If the users find something, which they can use to take their business ahead with great strides, they are surely going to open the emails and go through them on a regular basis. This email from Audaxium thanks the customer for attending a webinar and, at the same time, provides the links to relive the experience of the webinar. When you are sending the email messages during the drip campaign, you’ll have to keep one thing in mind. You are trying to make the recipients open the emails. So, it is a good idea to design the emails the way they would like. You can personalize each email for the recipients. They should have their names on it, addressed to them. Besides, the content of the email should also be customized according to their requirement after proper research. Only then it is going to offer the best results. An email drip campaign can be used for multiple purposes. In addition to getting leads, it can also come in handy to maintain the relationships with your customers and stakeholders. So, you have to perform it properly to get the best results from it.